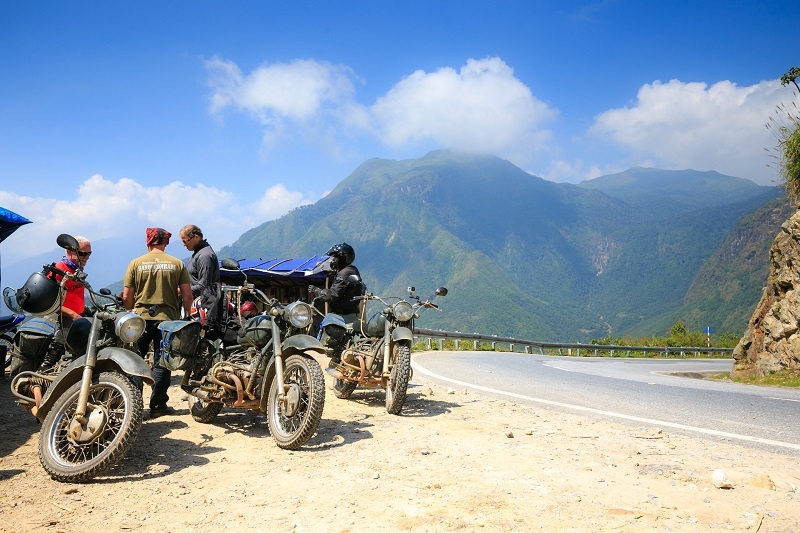 Only backpackers or adventurous travellers go to Sapa by motorbike, there are some roads towards Sapa however 2 main roads is from Hanoi to Sapa via Lao Cai or take the direction of Lai Chau. The route that passes Lao Cai and then to Sapa is close and easy to travel, however if you go through Lai Chau you will have a chance to conquer 2 among 4 legenday mountain passes in the Northwest is Khau Pha pass, 30 km and O Quy Ho more than 50 km. Not only conquering the pass, stops to rest and enjoy the scenery, take pictures...Traveling by motorbike also saves your money, only about 7 usd for the petrol you can travel nearly 400km distance, too good for a backpacker with limited budget. Here are directions for you to Sapa by motorbike or private cars. - Option 1: From Hanoi to Vinh Phuc - Viet Tri town, Phong Chau district, Doan Hung District, Yen Bai town, Lao Cai and Sapa, total 360 km. From Hanoi to Vinh Phuc after you cross Thang Long bridge you turn left at Tien Phong of Phu Cuong junctions, from Doan Hung district you follow highway 70 to Lao Cai city then continue 4D highway to Sapa town. - Option 2: From Hanoi to Hoa Lac district - Trung Ha bridge - Phong Chau district - Doan Hung - Highway 70 - Lao Cai - Sapa, total 370 km. - From Hanoi to Hoa Lac - Son Tay district - Thanh Son township, along Highway 32 to Sapa, total distance is 420 km. From Hanoi to Son Tay and Thanh Son on highway 32 you will see the Khau Pha pass over 30 km before arriving in Mu Cang Chai and Hoang Lien Son national park, here you have a chance to climb O Quy Ho pass 50km. Conquering 2 of the 4 greatest passes in Northwest Vietnam is really a memorable experience. In addition on this route you can make a short stop at Love waterfall, Silver waterfall just 15 km from Sapa town. If you are interested in exploring new places, or want to hide away from crowds...There are places tourists rarely come, there is here a Sapa different from the hustle and bustle in town, a Sapa with the wild beauty of northwestern mountains - it's remote village of Sapa such as Thanh Kim, Nam Cang. To take this all the way around 30km.